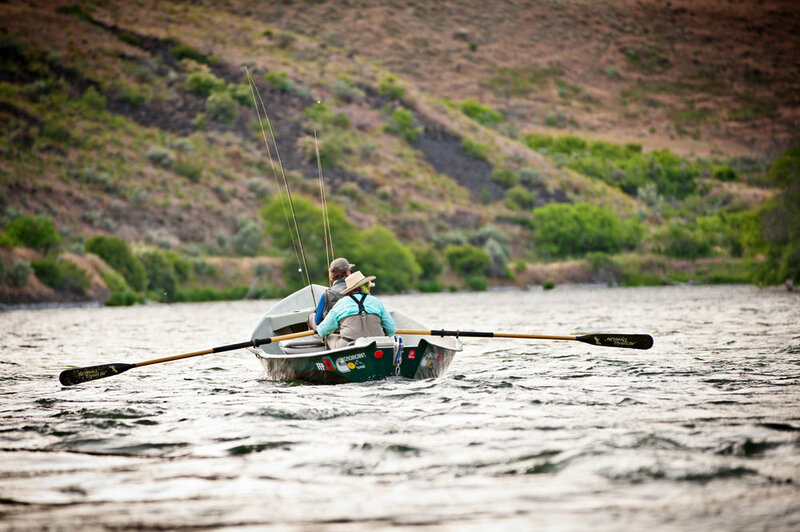 A day of drifting and fly fishing the Lower Deschutes River just an hour from Bend, Oregon. Wade and fly fish for wild "redside" rainbow trout on Central Oregon's blue ribbon trout stream, the Lower Deschutes River. Our daily guided drift boat trips from Warm Springs to Trout Creek provide turn key access to some of the best fly fishing near Bend. Here we provide a day of fly fishing tailored for families, corporate groups, or just real people who love to fish. Meet your guide in Bend, Oregon and carpool about one hour to the Warm Springs Boat Launch on the Lower Deschutes River. This is where your ten mile fly fishing float trip begins. Alternatively you can meet your guide at the Madras Safeway grocery store. From Madras your guide will take you to the river and back to your vehicle at the end of the day. We typically fish two anglers per boat and guide, however three anglers per guide can be arranged. The drift boats are used for transportation down river and provide access to both banks as well as many productive islands and gravel bars. There is no real whitewater in this stretch and the drift boat provides a safe and comfortable ride down river, making this trip appropriate for just about any age level. All fishing is done on foot. You will need waders and wading boots, although just wading boots and shorts (wet wading) are fine during warmer summer weather. Rental waders and/or wading boots are available. We fish for redsides, an all native subspecies of rainbow trout that average 13 inches in length and provide huge sport on a five weight fly rod. Larger fish are common. We focus mostly on dry fly and nymph fishing for redsides, and are happy to pass along skills and technique. We can provide fly rods for you to use as well as instruction. Our guides are patient teachers and are happy to be there. Fly fishing for trout on the Deschutes is generally good spring through fall. Aquatic insect hatches keep the trout visibly feeding on the surface many days throughout the season. 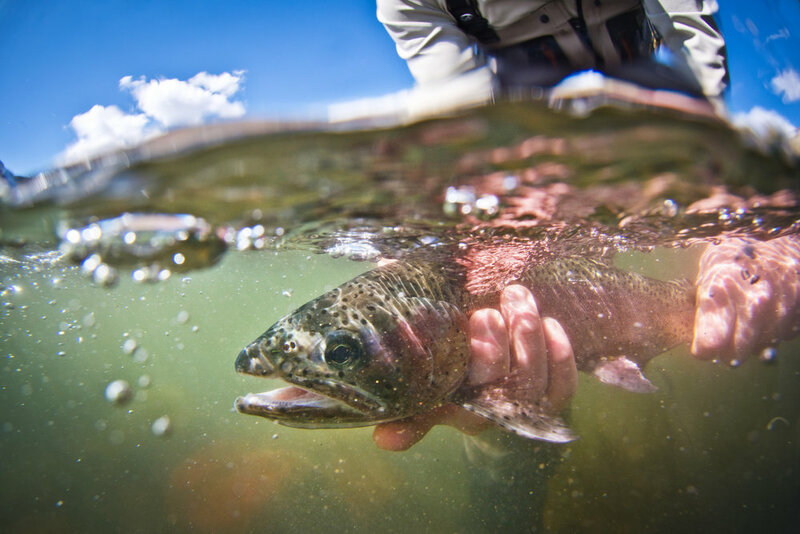 One of the more popular times to fish the Deschutes is in May and June during the salmonfly and golden stonefly hatch. When the trout aren't rising we use nymph fishing techniques as the trout do much of their feeding subsurface. 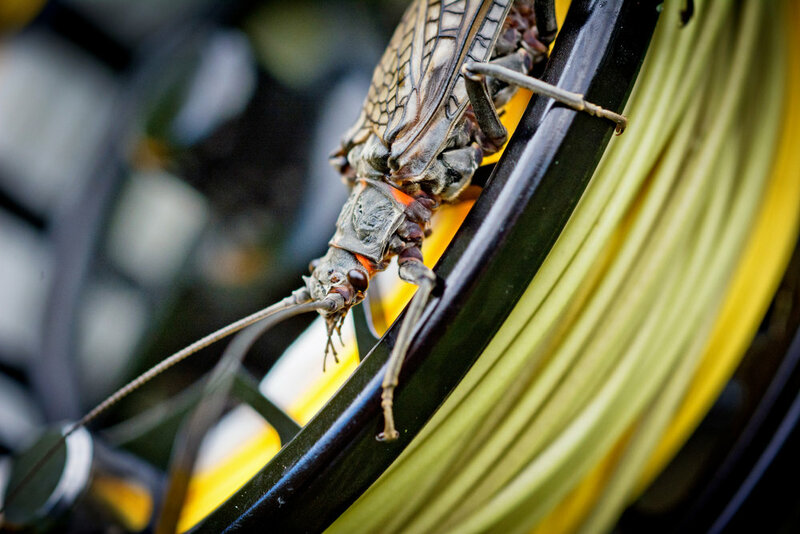 Matching your flies to the insects that the fish are eating, or "matching the hatch", is a fun and engaging aspect of the sport of fly fishing for trout. Lunch is included, served either streamside or right in the boat. Please remember to let us know if there are any dietary requirements or preferences. We typically hit the take out at Trout Creek Campgrounds around 5:00 pm, and you will most likely be back in Bend by 7. Special schedule arrangements can be accommodated with advance notice. Included: Guided fishing (one boat and guide per two or three anglers), lunch, non alcoholic beverages, fly rod setups, flies and fishing tackle. Transportation from Bend, Redmond, or Madras can be arranged (free of charge). Not Included: Waders and / or wading boots, fishing license, Deschutes Boater Pass, Warm Springs Tribal Permit, alcoholic beverages, guide gratuities. 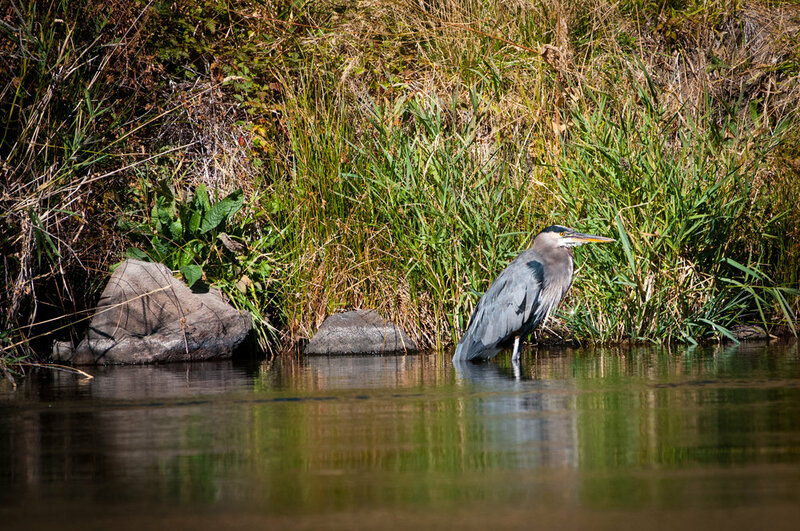 You Will Need: Waders and / or wading boots, fishing license, boater pass, and tribal permit. We can assist you with obtaining most of these items. Last Saturday in April through October 31st. Our daily fly fishing drift boat trips begin at the Safeway grocery store parking lot in Madras, Oregon, about a 45 minute drive from Bend. From Madras we provide transportation to the river and back. Round trip transportation from Bend, Oregon is provided but not required. Departures from Redmond and Madras are also available. Depart Bend with your guide at 7:00 am. Drive one hour to the Warm Springs Boat Launch. Full day of fishing, lunch on the river. Take out at 5:00 pm. Drive back to Bend, arriving at 7 pm. We can have you back in Bend earlier if you would prefer. When it comes to teaching fly fishing we believe that less is often more, and we try to keep things light and fun. Not too much technical talk. No bug Latin. I am going to tell you about one of the greatest days of my life so far.